The Palmered Eyed Dog Nobbler Black is a variant of one of the best killing patterns of all time, The Nobbler. It is weighted so sinks fast, for when the trout are lying deep, and for when they are feeding just below the surface retrieve just after it hits the water. For cold, windy conditions, use the larger size 8 and for normal conditions the size 10 is deadly. If the water is clear and the fish are shy then try size 12. The Nobbler kills trout throughout the year and is available in a range of sizes and colours to suit all conditions. 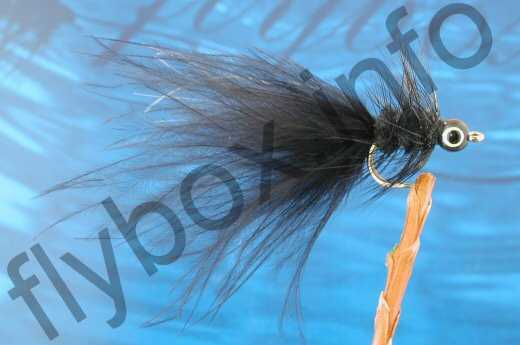 Tail : Black marabuo with four strands of pearl tinsel. For extra weight lead wire on the shank can be added.